Trust Cincinnati’s concert:nova to match the right event with the right venue. 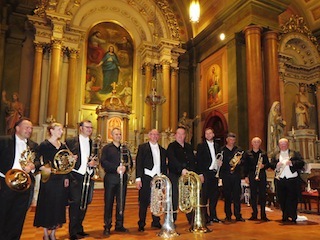 They did it again Wednesday night at Old St. Mary’s Church in Over-the-Rhine with a performance by the Harmonic Brass of Munich, Germany. Joining the visitors – trumpeters Hans Zellner and Gergely Lukács, French hornist Andreas Binder, trombonist Thomas Lux and tubist Manfred Haberlein -- was a quintet of concert:nova brass, including trumpeters Doug Lindsay and Steve Pride, hornist Lisa Conway, trombonist Cristian Ganicenco, and Carson McTeer on tuba. The occasion, a kind of “Music of Two Cities” (Munich is Cincinnati’s sister city), marked the opening of c:n’s 2013-2014 season and the second event of the 2013 Constella Festival of Music and Fine Arts. Historic Old St. Mary’s, built by German immigrants in the mid-nineteenth century, shone in more ways than one, the sounds of the brass complementing its Greek revival/Romanesque interior to perfection. The Harmonic Brass, a busy touring group with numerous CDs and sheet music to their credit (much of it on sale at the concert), entertained royally, both on their own and in combination with the c:n brass. It was a mix of classics and contemporary music – Gabrieli to Michael Jackson -- for brass and double brass quintet in arrangements by the Harmonic Brass and c:n’s Lindsay. The first set by the Harmonic Brass opened with the bustling “Arrival of the Queen of Sheba” from Handel’s “Solomon.” Others included Bach’s Fugue in G Minor (“Little Fugue”) with Zellner on piccolo trumpet and Carl Orff’s “O Fortuna” from “Carmina Burana,” which neared sensory overload with its wall of gleaming brass. An element of theatricality entered into the Harmonic Brass’ performance. To close out the first half, they gave a reading of the Triumphal March from Verdi’s “Aida,” complete with entrances, exits and “offstage” performance by the trumpets. To close the evening, the ten brass men reunited for “Olympic Spirit,” a John Williams arrangement by Zellner, which soared out into the night. The happy crowd demanded an encore and the Harmonic Brass obliged with the lullaby-like Bayrischer Abendsegen (“German Evening Prayer”) by Otto Hornek.